Ramen Gaoh was opened up by the Menya Kouji Group (Ramen Butcher, Ramen Gojiro). While I’m not thrilled with the ramen at Ramen Butcher, and I think Gojiro’s Jiro-kei ramen to be grotesque and the ramen equivalent of Jethro’s Fine Grub, early positive intel from Moyenchow convinced me to check this place out. This space used to be Papa Joe’s Pizza in the 90s (blurry photo on this 90s-looking website here). I spent a bit of time in this neighbourhood during my SFU days. I used to get the spinach pizza with ground beef and feta. It wasn’t fancy stuff. It’s a particular style of thick crust pizza made with commodity ingredients that hits a certain spot, especially for a slacker student like I was back then. Storytime: Once while waiting for my slice of spinach pizza to be warmed up, this guy (presumably a 90s, politically aware vegetarian) walks in and asks the guy behind the counter if their cheese contains rennet (an animal-derived enzyme used in cheesemaking). The worker had no freaking idea what the guy was talking about. Not even Flying Wedge was using vegetarian or vegan cheese back then… They probably could’ve made him a cheese-less vegetarian pizza but he was only interested in a slice. Beside Ramen Gaoh is Wah Lun Chinese Restaurant, right where Dragon Inn used to be back in the 90s (photo of their iconic neon sign here). 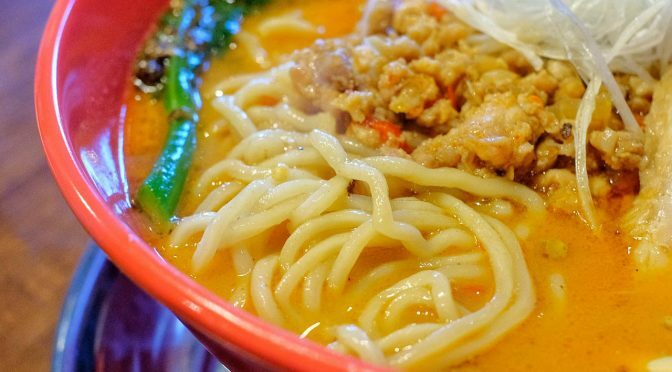 A bit further down the block is another ramen spot, the Chinese-run Hakkaku Ramen. I have yet to eat at a Chinese or Korean-run ramen place that is as good as Japanese-run ones. It shouldn’t matter as long as the proprietors know what quality is and maintain it, but in my experience Japanese-run places just have a better batting average. Would I be sick and tired of ramen after eating twice at Kokoro Tokyo Mazesoba earlier in the week? Silly question. New business bouquet. The creative spelling makes it feel more authentic. Some of the topping prices seem out of whack. Eg. cilantro for $1 but you can get two pieces of chashu for only $2?? Le menu. Four flavours of ramen, all miso-based. They have a vegetarian miso ramen that uses soy milk! Bowls range from $11.25 to $12.25 without egg, so technically more expensive that Ramen Butcher in Chinatown. Whenever I try a new ramen place, I try to get the most simple, basic bowl. Usually a shoyu or shio if it’s available, so I can really taste the base broth without distraction. I find that miso paste already has so much good, strong flavour that it can compensate for weaker broths. But since this place is all about the miso, I sprung for their spicy miso bowl, Scorpion Ramen, with “secret miso blend”. The kodawari point-oh* here is that it’s not just spicy, it’s numbing as well! Very Sichuan-esque, combining chilies with numbing Sichuan peppercorn. AFAIK, this is the only place in town that serves a spicy AND numbing mala ramen! You can choose your level of spiciness and numbing from 1 to 3, with 2 being “nomal”. * a reference to Ramen Adventures on YouTube. We saw several staff members with Ramen Butcher t-shirts. Original Karaage ($6.50). Not good. I chalk it up for opening week jitters. Some pieces had an over-fried, burnt flavour coming through. Very dry meat. Also didn’t taste like it was marinated. No detectable ginger flavour. Pass. Moyenchow’s Shiro Miso ($11.50). You’ll have to wait for her review to see what this bowl is like. I liked seeing the glob of grated ginger on top. Ajitama ($1.50) look reasonably well done but are extra no matter which bowl you get. Scorpion Ramen with level 2 spiciness and level 3 numbing. My painfully joyful Scorpion Ramen ($12.25). Comes with a stalk of gailan (Chinese broccoli), spicy ground pork, a single medium-thick slab of chashu (shoulder), shredded leeks (ugh), bamboo shoots, and a dollop of what looked and tasted like chili bean sauce. The broth itself already has a good amount of spice, so we were wondering if you simply get a bigger dollop of chili sauce if you get level 2 or 3. Undetermined at this point. M A N T H A T ' S G O O D M E N // Crammed in a #lunch in #BridgelandYYC at my fave @shikimenya. #Tonkotsu Classic ($14) imho surpasses the majority of #ramen places in Vancouver. That tender grilled #chashu is off the freakin' hook, you betta recognize! 👊 A heady smoky char and soy sauce notes flood your senses. The chashu is unparalleled in Canada. If you know if better, I'd love to try it! Their housemade noodles have great toothsome chew and flecks of kombu right in the dough. The broth is rich, complex, but not heavy. It all comes together into a track you wanna hear again and again. #shikimenya #dtfincalgary17 #yyc #calgary #noodles #pork #charsiu // Check the FO-TY! 40oz malt liquor, that is. They love their hip hop culture here. The (housemade?) noodles are fantastic. Very firm with a great chew. They stayed firm throughout our lunch. I had to pause a lot while eating to wipe sweat from my scalp, face, and neck, but the noodles stayed great through to the very end. You get a single stalk of gailan. Can I swap the shredded leeks for another stalk of gailan? I hate shredded leeks in ramen — they just mess up my game. They cling to my chopsticks and they get stuck in my teeth. They’re like an edible version of toilet paper stuck to your shoe. The chili bean sauce had a ton of flavour — not just heat or saltiness. With level 3 numbing, I got plenty of that numbing sensation and slight citrus flavour that I love about Sichuan peppercorns. You can really feel the effects because it makes cold water taste tinny. Surprisingly, the first thing I tasted in the broth wasn’t an overt “HELLO THIS IS MISO” flavour. There was a lot of depth and complexity to this chicken and pork-based broth. Tons of umami, electrified by spice and numbing Sichuan peppercorns. I kept going back to the bowl for more. A sweaty, masochistic experience. For reference, the overal spiciness level of level 2 is a slight notch below DownLow Chicken Shack’s “hot” level Nashville-style hot chicken. I think next time I’d be plenty satisfied with level 1 spice and level 3 numbing, if my pile of used tissues was any indication. Recommended. The location is a bit far for me, but very worthy if you’re in the area or on your way to Chez Christophe. 3 and 3 for me, sniffles be damned!